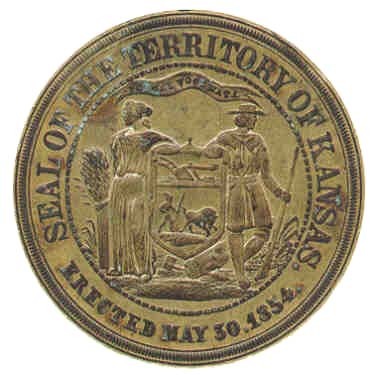 The seal of the Territory of Kansas features a pioneer holding a rifle standing with Ceres, the Goddess of Agriculture, with a sheaf of grain, and a shield with a plow in the top part and a hunter and a buffalo in the bottom part. At the feet of the pioneer and Ceres is a tree and the ax that felled it. Above the image is, in Latin, POPULI VOCENATA, which means "Born by the voice of the people." 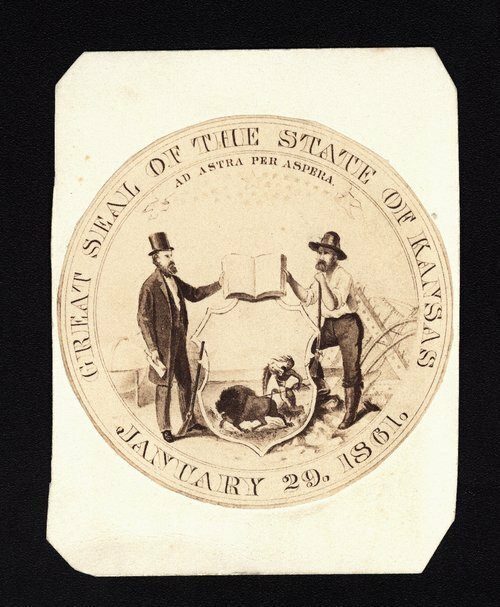 The original draft of the seal of the State of Kansas was much more simple than the one eventually chosen. The seal shows a farmer and a businessman holding a book over a shield that features and image of a Native American hunting a buffalo. Above the men features the state motto "Ad Astra Per Aspera" and 34 stars. The seal we all know and love that is used on the state flag. 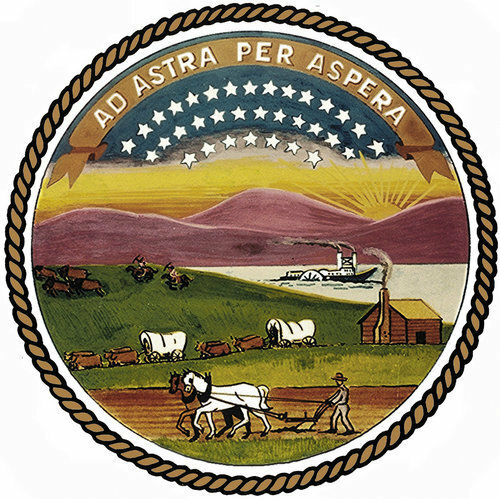 The rising sun represents the east, commerce is represented by the river and steamboat, agriculture and future prosperity of the state is represented by the settler's cabin and the man plowing the field. The train of oxen represents heading west while in the background, a herd of buffalo are pursued by two Native Americans. Above the scene is the state motto and 34 stars.